Into English allows readers an extraordinary opportunity to experience the process and artistry of translating poetry. 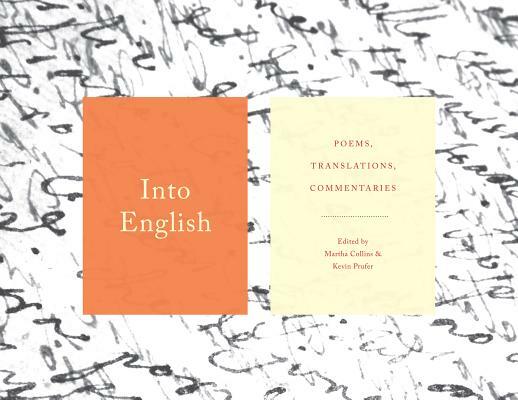 Editors Martha Collins and Kevin Prufer invited twenty-five contributors, all of them translators and most of them also poets, to select one poem in another language and three English translations of it, and then to provide an essay about the challenges and rewards of translating it. This anthology offers the original poem and the translations side by side, so readers can compare the translations for themselves. Contributors include Kareem James Abu-Zeid, Willis Barnstone, Chana Bloch, Karen Emmerich, Danielle Legros Georges, Johannes Göransson, Joanna Trzeciak Huss, George Kalogeris, J. Kates, Alexis Levitin, Bonnie McDougall, Jennifer Moxley, Carl Phillips, Hiroaki Sato, Cindy Schuster, Rebecca Seiferle, Adam Sorkin, Susan Stewart, Cole Swensen, Arthur Sze, Stephen Tapscott, Alisa Valles, Sidney Wade, Ellen Doré Watson, and David Young. Martha Collins is the author of four previous poetry collections, including Some Things Words Can Do, and co-translator of two volumes of poetry from the Vietnamese. She teaches at Oberlin College and lives in Oberlin, Ohio, and Cambridge, Massachusetts.